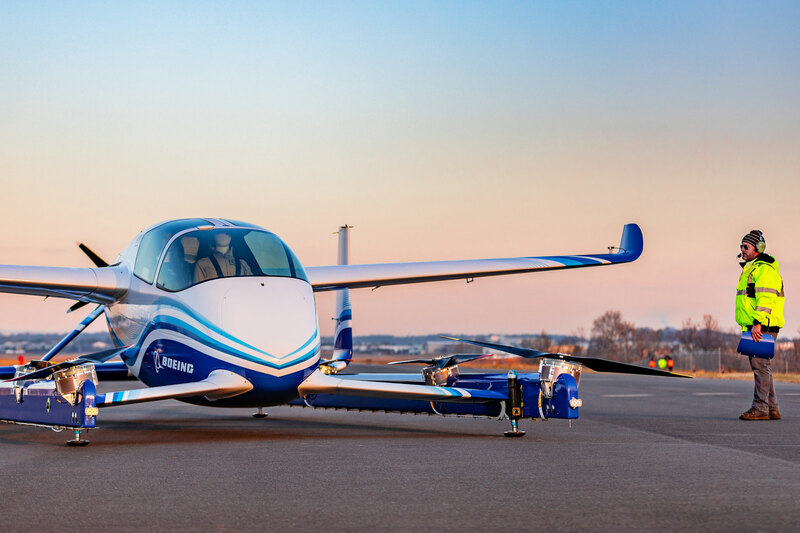 Boeing NeXT completed the first test flight yesterday of its electrically powered, fully autonomous passenger air vehicle (PAV) eVTOL prototype in Manassas, Virginia. The aircraft, designed by Boeing subsidiary Aurora Flight Sciences, completed a controlled takeoff, hover and landing during the flight, which tested the vehicle's autonomous functions and ground control systems. Future flights will test forward, wing-borne flight, as well as the transition phase between vertical and forward-flight modes. The PAV measures 30 feet long, 28 feet wide, and has a maximum range of 50 miles. It integrates propulsion and wing lift to achieve hover and forward flight. Power is distributed to a multi-blade propulsor in the rear of the aircraft for thrust and to eight smaller rotors positioned on beams beneath the wings to create lift during hover/low-speed operations. "This is what revolution looks like, and it's because of autonomy," said John Langford, president and CEO of Aurora Flight Sciences. "Certifiable autonomy is going to make quiet, clean, and safe urban air mobility possible." Boeing NeXt also is developing other platforms, including an unmanned fully electric cargo air vehicle (CAV) designed to transport up to 500 pounds. The CAV has been successfully flown indoors and will transition to outdoor flying later this year.